Repairing cracks and holes in plaster walls can be a confusing prospect, given the variety of hole-patching products on the market. The characteristics of the damage to be repaired are the best indicator of the best product for the job. Plaster wall surfaces are constructed from layers of hard plaster that are built up over a wood or metal framework called lath. The plaster itself consists of a mixture of lime or gypsum, an aggregate such as sand, and water. The plaster is troweled onto the wall surface wet, and when it dries, it forms a very hard, durable surface. Plaster sets quickly and is generally more difficult to work than joint compound or patching compound. 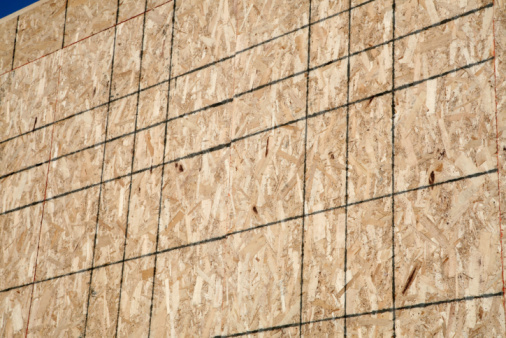 While plaster-and-lath construction was common in older homes, walls in modern homes are more often built with wall board, also often called drywall or sheetrock, screwed to wooden wall studs. Wall board consists of a layer of gypsum sandwiched between paper outer surfaces, and is manufactured in large, rectangular sheets. After drywall contractors install wall board, they cover the seams between sheets with seam tape and cover the tape with joint compound, which is also sometimes called mud. Joint compound typically consists of a gypsum-based powder that's mixed with water to form a paste. Different joint compound formulations are intended for different jobs, such as taping or finishing, and they vary in their weight, drying times, ease of sanding and resistance to shrinkage. Many joint compound formulations dry relatively slowly, and you may have to wait several hours or even as much as a day before you can sand or paint over them. Spackle was a originally a trademark for a specific product but has come to be used as a generic term for patching compounds: products designed to repair small imperfections in plaster or drywall surfaces. Although the original patching compounds were, like plaster and joint compound, powdered products that needed to be mixed with water, modern patching compounds are typically pre-mixed paste or putty-like products sold in jars and ready to use. Patching compounds typically dry quickly and remain workable for only a few minutes; they may be sanded and painted in as little as an hour after application. Some patching compounds are made with a gypsum base, and they are vulnerable to shrinking and cracking as they dry. Others are made with a vinyl or acrylic base, which makes them especially flexible and shrink-resistant. It is even possible to make homemade hole filler compounds using household products such as baking soda and white glue. Patching compound is often confused with caulk, which is a flexible substance primarily used to seal gaps and seams, and painter's putty, which is used to fill holes in wood. These products usually are formulated on a base of oil, latex, or synthetic polymers and are not well suited to making repairs in plaster or wall board. The best product to use for repairs to plaster walls depends on the extent and nature of the repair. Superficial cosmetic repairs can be made with a basic patching product, but significant structural repairs require a more dramatic solution. Nail holes, surface scratches and shallow gouges can be filled with patching compounds. When these repairs are made to a textured plaster wall, a spray-on texture product can help to hide the repair. Patching compound is less likely to work well for larger repairs, however, because it tends to shrink and result in an uneven surface. When the damage to a plaster wall extends deeper than the surface layer of plaster, through the base layers or even all the way to the lath, it's likely that neither joint compound nor spackle will be durable enough to make a lasting repair. The best way to repair the damage is to apply multiple layers of plaster, and in the case of large holes, it may be necessary to repair the lath underneath the plaster, too.